What does the future hold for 538's live podcasts? What does the future hold for 538’s live podcasts? The presidential election is less than seven weeks away, and political sites and blogs like ESPN’s FiveThirtyEight are predictably seeing large spikes in web traffic. 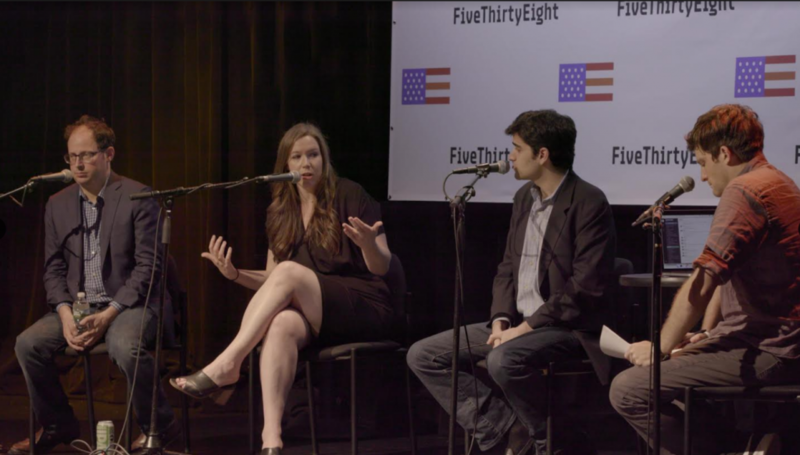 FiveThirtyEight has been capitalizing on its election year popularity with a series of live podcasts in different cities across the country, most recently on Monday night at Times Square in New York City. The success of its election podcast and its live episodes is making FiveThirtyEight think about the future of the political podcast beyond election day, but the expansion of its podcast network and live shows to other topics and subjects the site focuses on. Awful Announcing spoke with Editor-In-Chief Nate Silver and Managing Editor David Firestone about the present and future of FiveThirtyEight’s podcast network and the site as a whole. The so-called election year bump is definitely real at FiveThirtyEight, according to site and podcasts metrics they provided. “According to the latest comScore metrics for the month of August, the site attracted 9.5 million unique visitors — the second highest total in its history,” an ESPN spokesperson told AA via email. The site’s real time Election Forecast, which factors in national polls and proprietary metrics to predict the outcome of presidential and senatorial elections in every state, was the most popular piece of content across all ESPN properties, according to the provided metrics. FiveThirtyEight podcasts across the board were downloaded over 7.8 million times in August alone, a 422 percent increase from February. “The podcast has proven to be shockingly successful and popular for us,” Silver told Awful Announcing. 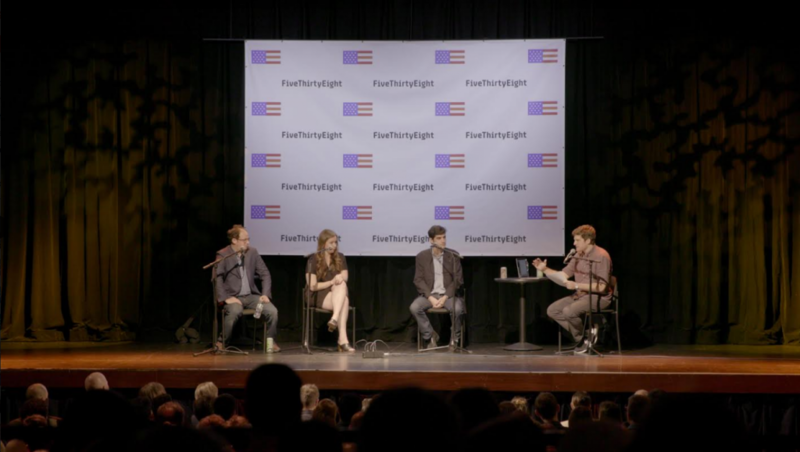 FiveThirtyEight had a successful three-city live tour earlier this year in Washington D.C., Los Angeles and San Francisco, selling out each show quickly, Firestone said. So a sold-out crowd of 2,100 packed the PlayStation Theater on Monday to see and interact with Silver, Harry Enten, Clare Malone, Farai Chideya and host Jody Avirgan. They discussed how the recent bombings in the New York City area would impact the election, a preview of next week’s first presidential debate, some election trivia and the quintet conducted a Q&A with the live audience. “The purpose of podcasts in general is, I think, we deal with some very technical and dense material, but we still want it to be relatable,” Silver said. “You want to talk to people like they’re our friends or our colleagues.” And the live podcasts take that to another even more intimate level, he said. FiveThirtyEight wanted to ensure that the live podcasts were just like the studio recorded editions as much as possible, including Avirgan reading promotional commercials live, where— to the delight of the crowd— he was struggling with sponsors Trunk Club (making sure to enunciate the k to not sound like a p) and ShipStation (making sure to enunciate the p). As the election season is coming to a close, FiveThirtyEight is contemplating and evaluating what they should do next with podcasts. The pre-election bump will almost certainly come with a decrease in unique readers, downloads and revenues. Firestone said that the site is seriously considering starting podcasts in other subject areas FiveThirtyEight covers, including science and economics. The live podcast model is definitely working in this election year, and Firestone, Silver and other ESPN brass now need to determine if it will be a major part of their business model in years to come. Shlomo Sprung is a writer and columnist for The Comeback and Awful Announcing. He's also a baseball contributor for Sporting News and the web editor of the Brooklyn Daily Eagle in NYC. A 2011 graduate of Columbia University’s Journalism School, he has previously worked for the New York Knicks, Business Insider and other publications. You should follow him on Twitter.